Tuscany was one of the last places I visited with my grandmother, who passed away in the summer of 2017. We had a wonderful time there. We ate meals under the stars, shopped in the small towns and, of course, drank the bright and juicy red wines of the region. I felt the pull of Tuscany even before this trip. I visited on my honeymoon in 2011 and again several years later. Most recently, I was there to participate in L’Eroica, a non-competitive bike race on the region’s unpaved “white” roads. It’s an enchanting place, with its rolling hills, ancient wineries and hilltop towns. It is possible to have an experience like the one represented in Francis Mayes’ best-selling novel, Under the Tuscan Sun, if you do your research. Tuscany is a vast area and some towns, like Montalcino, have become too touristy for my taste. 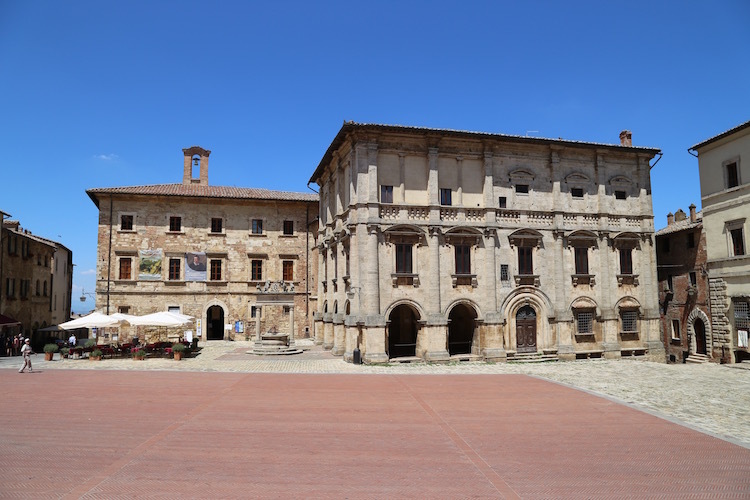 Montepulciano and Cortona have a good mix of local life and tourism. The cuisine in Tuscany is delicious. It’s known for having some of the best steak in the world and dishes like ribollita soup and panzanella salad are Italian comfort food at its best. New boutique hotels infusing ancient farmhouses with sleek, contemporary design, are bringing modernity to the region. I have yet to make it to every village, this could take years, but my visits have given me a good lay of the land and some favorite restaurants, hotels and wineries to share. Travelproper tip: Renting a car is essential for getting the most out of a trip to Tuscany. You will most likely be flying into Florence if Tuscany is your destination. Most major rental companies are represented, but leave plenty of time for your car pick-up. Lines can be long. In 2015, I visited Tuscany with my sisters, mom, grandmother and nephew. I love this picture of them outside the butcher shop in Panzano-in-Chianti. 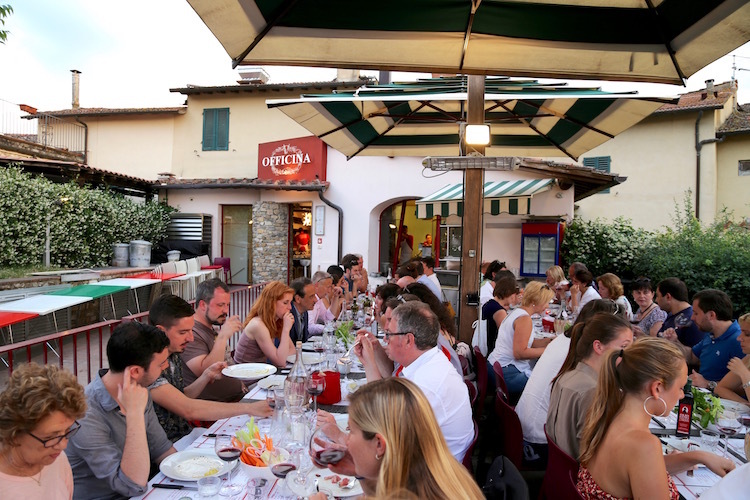 Master butcher Dario Cecchini’s small restaurant empire consumes nearly an entire street in tiny Panzano-in-Chianti. He has two restaurants and a butcher shop that is impossible to miss thanks to its red and white striped facade. Both Solociccia and Officina Della Bistecca serve family style meals at a fixed price. At Solociccia, diners feast on six meat courses like spicy meat ragu on toast, seasonal vegetables and the region’s famed white beans with extra virgin olive oil. At the slightly more expensive Officina, it’s all about beef. The meal begins with steak tartare and continues with Panzanese steak and baked potatoes. The meal’s crescendo is the Tuscan specialty Bistecca alla Fiorentina, a slab of grilled bone-in rib eye served rare, that is brought out, literally, with the sounding of a bugle. The menus include house wine, bread, dessert and grappa and communal tables make for a memorable evening. Reservations are recommended for dinner. Dinner at Officinal della Bistecca is at communal tables with plenty of table wine. 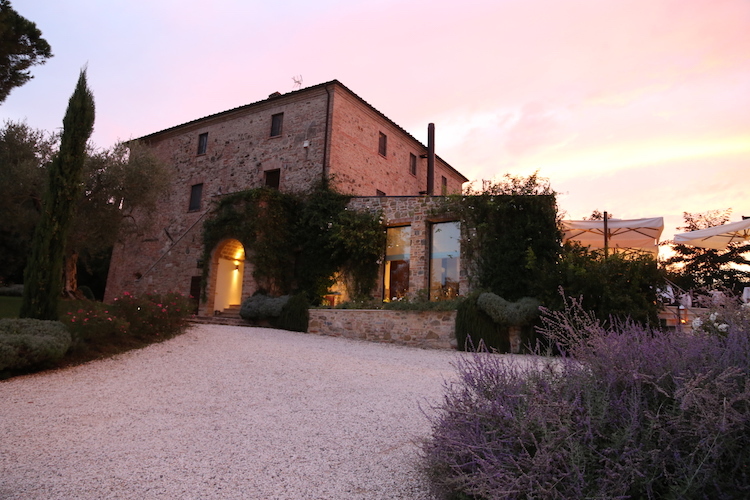 This beautifully restored medievel castle winery specializes in smooth Chianti Classico. Castello D’Albola is owned by one of Italy’s largest producers, but it doesn’t feel too corporate. Castello D’Albola offers free winery tours several times a day and wine tasting portions are generous. Wines are reasonably priced. Considered the birthplace of Chianti Classico, Castello Di Brolio is one of the oldest wineries in the world. The castle dates back to 1000 AD. I found the tasting room, located in a more modern building at the bottom of the hill, to be lackluster, but the castle is stunning. Park in the designated parking area and climb 15 minutes up the forest path to the castle gates. Purchase a ticket and enjoy a walk through the grounds. A very unique and grueling non-competitive cycling race takes place in Tuscany each October. L’Eroica requires riders to ride road bikes made in 1987 or earlier and wear vintage cycling attire. 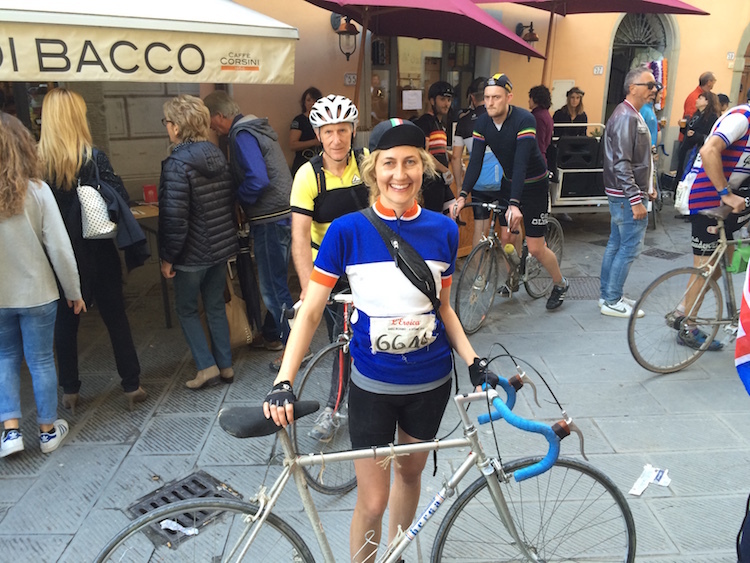 These steel-framed bikes are often heavy, have finicky gears, if any, and the ride is on unpaved roads up and down Tuscany’s endless rolling hills. It’s still really fun. The scenery is gorgeous and there are stops in some of the small towns where riders get to fuel up on table wine and local cuisine. The race begins in Gaiole-in-Chianti, but depending on which route you choose, you may ride all the way to Montalcino and back. 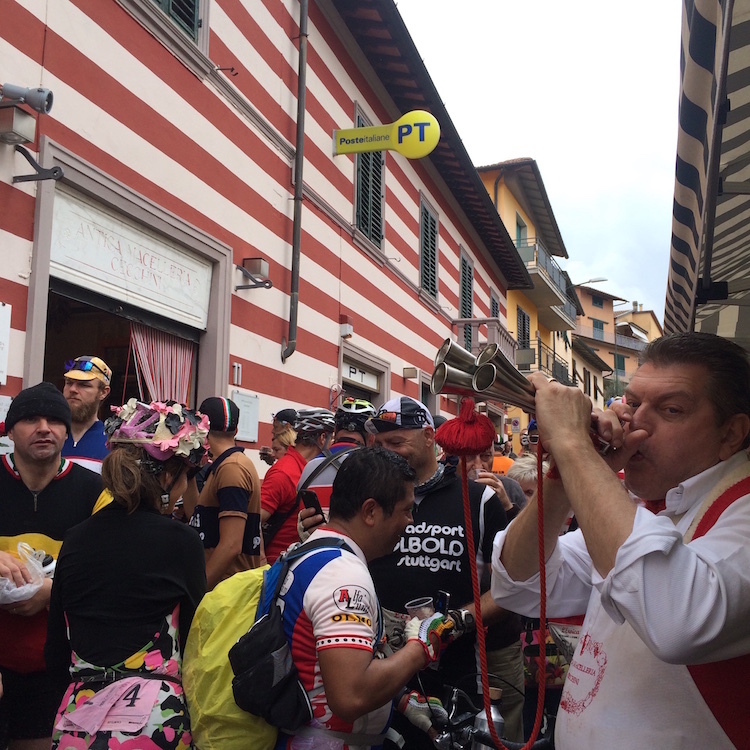 One of the food stops during L’Eroica is in Panzano-in-Chianti. That’s famed butcher Dario Cecchini on the right. This seven bedroom villa in Gaiole-in-Chianti is furnished with an eclectic mix of family heirlooms and more modern pieces like Barcelona chairs. 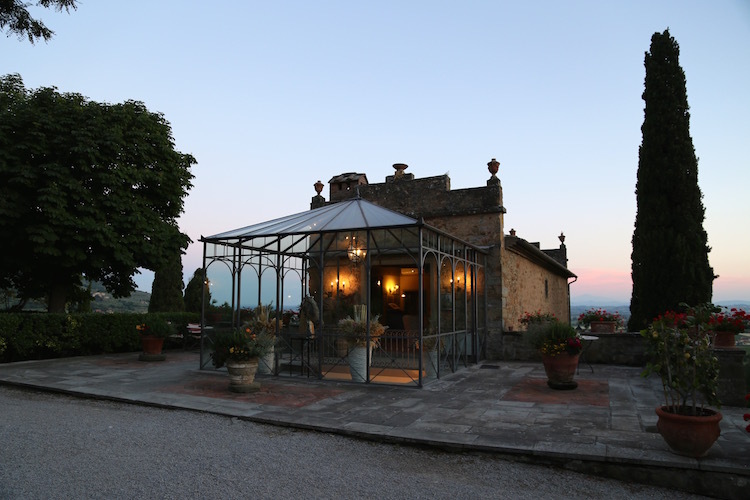 Located on a 100-acre farm, the 17th century villa has a jaw dropping location at the top of a steep vineyard and impressive views of Chianti’s rolling hills. Breakfast each morning features home made cakes and jam. This family run hotel in Panzano-in-Chianti’s main square is charming and a good choice if you want to be stumbling distance from Officina della Bistecca. Eating at this osteria is part dinner theater and part delicious meal. The stars of the show are Giulio Ciolfi, the owner/chef, and his meat cleaver. From the small dining room, you can watch him hack away at a huge piece of meat in the open kitchen. If you order steak (and you should), a two inch thick slab is brought to your table for inspection. If you approve of the size, Ciolfi will write the price down on your place mat and grill it for you with a simple preparation of olive oil, salt and pepper. A word of warning–the meat is served rare. Don’t scoff. My husband and I were fighting over the bone at the end of the meal. Steaks are are served in sharable portion sizes. Aquacheta offers two seatings a night at 7:30pm and 9:30pm. Seating is at communal tables and reservations are an absolute must. Not open Tuesday. We heard about this restaurant from a local and it’s has ended up being one of our favorite restaurants in Tuscany. Osteria Del Merlo is everything you hope to find in a restaurant while you’re traveling- delicious inventive food, great ambiance and affordable prices. We were aboslutely blown away by our appetizers on our first visit: grilled peach with gorgonzola cheese and a burrata and slow roasted tomato salad. Located at the end of Garibaldi square, the restaurant’s main dining room is located inside a medieval tower. The wine list offers all the regional favorites. If you decide to indulge in dessert, the chocolate cupcake, basically molten chocolate cake, is delicious. Located in the tiny Etruscan village of Castiglioncello del Trinoro, Cafe Monteverdi is a great place to grab lunch or a snack when you’re touring southern Tuscany. Like all the other buildings in Castiglioncello del Trinoro, the outside of the cafe has been preserved but the inside is very modern. There’s even an iPad on the wall where you can check email. Cafe Monteverdi is owned by the same person as the Villas at Monteverdi and Hotel Monteverdi (see below), but you don’t have to be a guest to eat there. The cafe has simple salads, meats, cheeses and paninis. It’s also the only place in the world where you can try Tenuta di Trinoro by the glass. The extremely exclusive wine is grown in the valley below. This wine store and restaurant in Montepulciano offers a great wine list and delectable small bites. 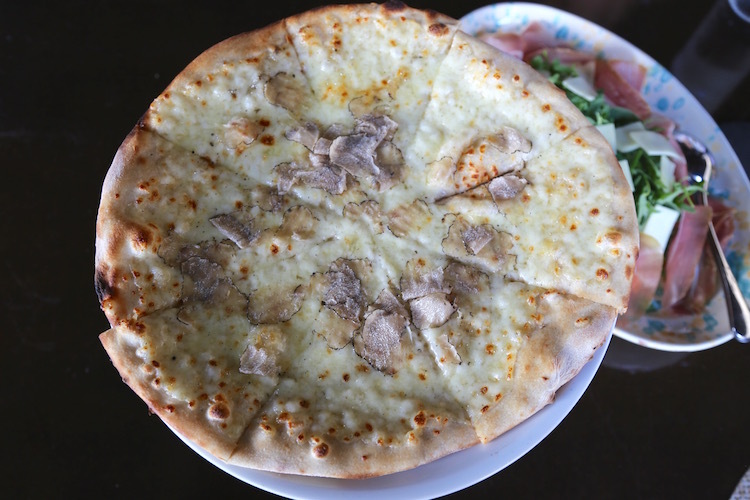 The restaurant is known for their bruschetta, but there are other fun things on the menu like pork shank with prunes and scallions and delicious meat and cheese plates. Go for lunch or a light dinner. Enoteca La Dolce Vita has several tables on the cobblestone street, but I also like the restaurant’s cellar-like interior. This restaurant in a 16th century building serves Tuscan food with a seasonal twist. Dishes might include gnocchi with pecorino di Pienza and pork fillet with apples and coffee. Cooking classes at Il Falconiere are held in a beautiful farm building. 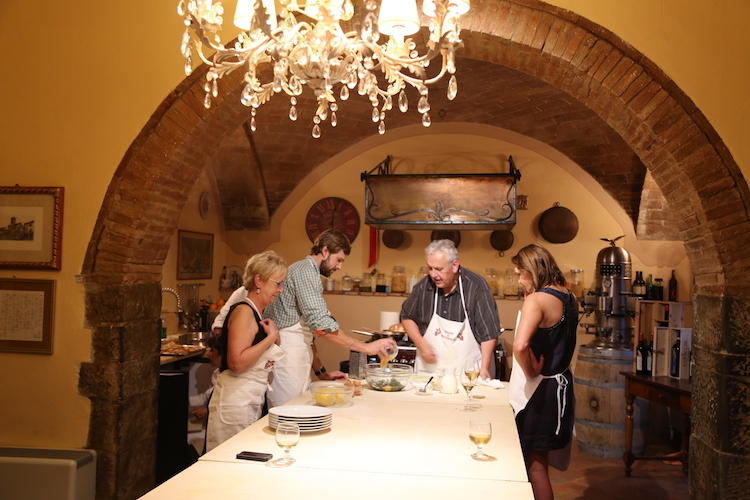 Tuscany is an excellent place to take a cooking class. Il Falconiere, a Relais & Châteaux property just outside Cortona, offers one of the best due to its enigmatic instructor and setting. The hotel is located in a valley surrounded by vineyards. Chef Silvia Baracchi also owns the hotel and winery along with her husband. Born into a family of restaurateurs and raised in Cortona, she knows everything there is to know about Etruscan cooking. During one of her cooking courses, you might learn to make light-as-air gnocchi, panzanella salad, chicken stuffed with sausage and thyme and cantucci. The almond biscotti is a local specialty. Students get to enjoy their handiwork, a meal served with plenty of Baracchi wine, on the terrace of the hotel’s Michelin star restaurant. The cooking school offers one day classes and more in-depth programs that can last three, five, or six days. The vineyards surrounding Il Falconiere. That’s Cortona, the setting for Under the Tuscan Sun, on the hill. Aged a minimum of four years in oak, Brunello di Montalcino is one of Italy’s most revered and expensive wines. The grape is a rare Sangiovese clone that is grown in the hills surrounding Montalcino. Unfortunately, the 14th century town seems to have one purpose only these days, selling wine. Its narrow streets are filled with wine shop, after wine shop, each the same as the last. Instead of tasting in town, go directly to one of the vineyards. Just outside of town, Casanova di Neri produces award winning Brunellos. Even if you’re not staying there, make reservations to taste at the winery of Rosewood Castiglion del Bosco. The organically farmed grapes and state-of-the-art winemaking facility produce balanced, silky wines including Campo del Drago, a structured Brunello made with grapes grown on one of the oldest vineyards at the estate and the Zodiac, a reserve Brunello from a high altitude plot that is aged for 36 months in barrels made out of 300-year old oak trees. Brunellos coast a pretty penny–you’ll be hard pressed to find a bottle for under 30 euros–but they can age for decades. This blush-colored Abbey sitting in a field surrounded by gentle Tuscan hillsides seems plucked from a painting. The church was built in the 12th and 13th centuries and is considered the most important Romanesque building in southern Tuscany. Simple and unadorned, the Abbey is a refreshing departure from many of Italy’s more famous and opulent cathedrals. From Siena take direction Buonconvento > Montalcino. Once in Montalcino follow the signs for Abbazia di Sant’ Antimo or Castelnuovo dell’ Abate. Before you reach Castelnuovo dell’Abate you will see the Abbey on your right. De’Ricci’s wine caves are located just off of the main square in Montepulciano. 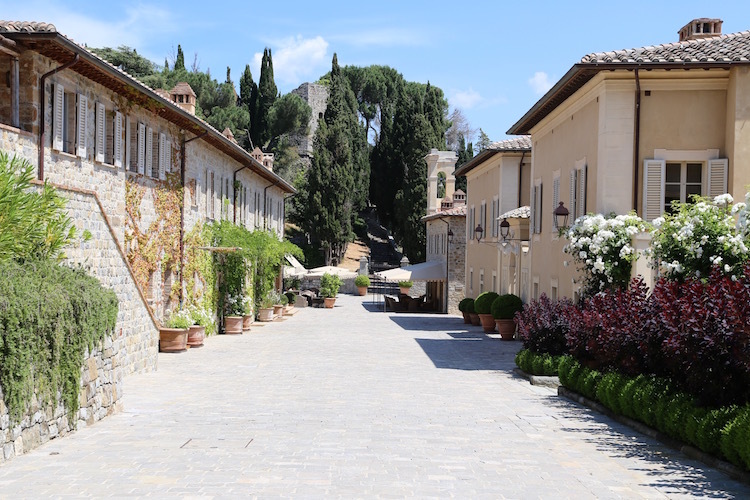 De’Ricci makes earthy, sun-kissed Vino Nobile but the most memorable part about visiting the winery is making your way to its tasting room deep within a hillside. After finding the entrance next to the historic Palazzo Ricci in Montepulciano, walk down an ancient staircase that leeds you through cavernous wine cellars. You’ll pass through rooms filled with large wooden casks of wine that look like they haven’t been moved for centuries, before ending at the wine tasting room and shop. 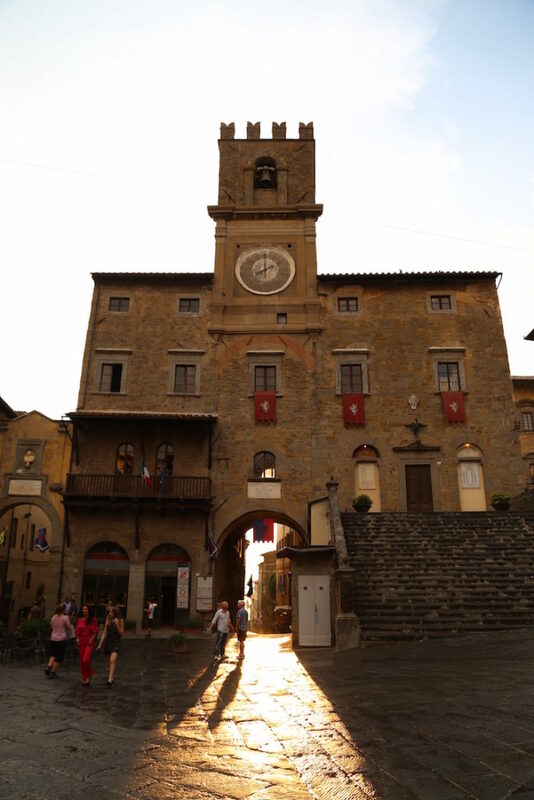 The main square in Cortona can be the beginning and end of a rigorous walk that takes you to an ancient fort. Tuscany’s hilltop towns will make you long for a flat stroll. Perhaps, none more than Cortona. The town, made famous by the book and film Under the Tuscan Sun, has a web of quant cobblestone streets that snake their way up a very steep hillside. Embrace it and put on your hiking shoes. At the very top, an ancient fort offers spectacular views of the countryside. It’s a good climb and will certainly leave your heart pumping. On the way down, treat yourself to gelato in the main square. To get to the top, just start walking up. If you pass the 19th-century Chiesa di Santa Margherita, you’re on the right track. Pienza is famous for two things, being the home of Pope Pius the II, and pecorino di Pienza cheese. The town is a bit touristy and I wouldn’t recommend staying there, but you can easily see everything in an afternoon. Park your car outside the city walls and stroll through town. Take time to appreciate the well-preserved Renaissance architecture and the beautiful Palazzo Piccolomini. The building contains the Popes private apartments. On your way out, stop at Bottega di Naturalista and pick from a mouthwatering array of pecorino. Choose fresh, medium-aged or the more intense “mature” depending on your taste. Technically in Umbria, the 14th century cathedral in Orvieto is a worthy detour. It’s a Gothic masterpiece. When you approach the cathedral, you’ll immediately be struck by the facade. The front, is gilded and ornate and the simple side walls, made of alternating white travertine and blue-grey basalt stone, provide an interesting contrast. The Dr. Seuss-like effect is echoed on the inside and gives the cathedral a more whimsical feel than other religious buildings I’ve visited in Italy. Once inside, you’ll be humbled by the sheer size of the nave, which was left uncluttered on purpose. The cathedral is famous for the Chapel of Madonna di San Brizio, or new chapel. Painted by Luca Signorelli in the 1500s, the frescoes depict the events surrounding the Apocalypse and the Last Judgment and are said to have influenced the style Michelangelo employed in the Sistine Chapel. As in all cathedrals in Italy, make sure your shoulders and knees are covered or they won’t let you in. Rosewood Castiglion del Bosco looks like a village, but it’s actually a luxury hotel. The luxury property owned by the Ferragamo family, is one of the most special resorts in Tuscany. The main part of the hotel is located in an ancient borgo or village. Historic stone buildings including the manor house, stables, and old winery have been restored (the village church containing medieval frescoes, has been untouched), but inside are luxury guest rooms with four poster beds and marble bathrooms. There are two fantastic restaurants. The casual Osteria La Canonica serves pasta and white truffle pizza, while at the more upscale Campo Del Drago, diners can do a tasting menu or order fresh seasonal fare à la carte. Rosewood Castiglion del Bosco’s vanishing edge swimming pool overlooking the Val D’Orcia, a UNESCO World Heritage Site, is stunning. This is a very family friendly resort. It even has a Kid’s Club where activities like cake making can be arranged. The food at Rosewood Castiglion del Bosco’s Osteria La Canonica is simple, but very good. The entrance to a guest room at Rosewood Castiglion del Bosco. If you’re interested in the Il Falconiere cooking school then consider staying there too. It’s a lovely property with guest rooms in historic farm buildings and country-chic decor. An excellent breakfast is included in your stay. There are two swimming pools and a spa. It is possible to walk to Cortona, but it’s a steep uphill climb. The restaurant at Il Falconiere has one Michelin star. 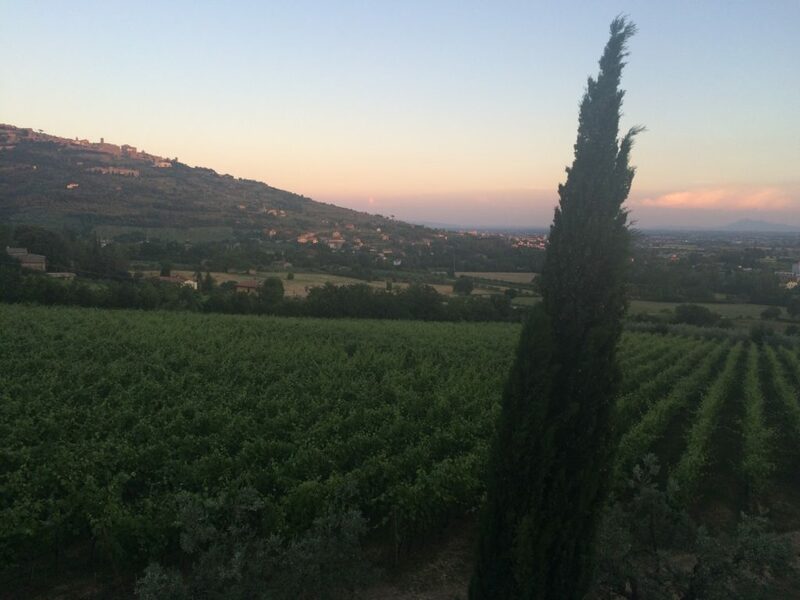 This unfussy hotel near the center of Cortona, has stunning views and very friendly service. Guest rooms have a period feel, decorated with antiques and heavy curtains, but they are nice and tidy. The enormous buffet breakfast caters the needs of it’s guests and includes specialities from the United Kingdom, Italy and the United States. 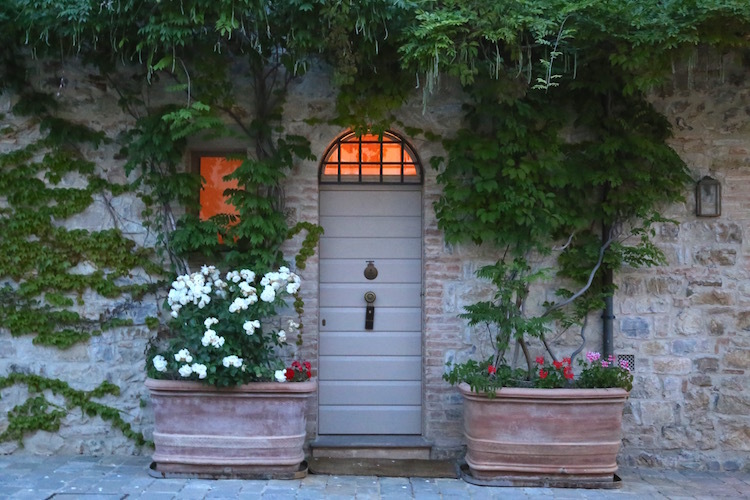 On the outside, Poggio Piglia looks like a Tuscan farmhouse, but inside it’s very modern. It took seven years to turn this tuscan farmhouse into a hotel, but the attention to detail paid off. There’s a vanishing edge swimming pool overlooking the countryside, and guest rooms have minimalist furnishings and large modern bathrooms. The hotel concierge provided us with excellent service. She made restaurant reservations and printed out directions on how to get everywhere. Starting at around 135 euros a night, the room rates are extremely reasonable for a place of this caliber. I highly recommend making this your base while you explore southern Tuscany. If you’ve always dreamed of staying in a villa in Italy, then consider the Villas at Monteverdi. Located in the 900-year old village, Castiglioncello del Trinoro, the villas have been beautifully restored and retain original stone facades, while the interiors offer all the comforts of a modern five star hotel. Owner Michael Cioffi, is behind the only privately funded archeological dig in Tuscany. When you visit Castiglioncello del Trinoro you might be able to see archeologists and historians at work. Accommodations can sleep 4, 9 or 12 people and require a Saturday to Saturday stay. Private dinners can also be reserved under a grape arbor. If you are traveling in a smaller group, consider staying at the boutique hotel in town, also owned by Cioffi. Rooms are large and luxurious with copper bathtubs, wood-beamed ceilings and earth-toned linens and furnishings. Monteverdi is charming, but it’s tiny town and about a 30 minute drive to Montepulciano. If you want easy access to a multitude of restaurants and shops in the evening, you might consider staying elsewhere. Family Friendly? Tuscany is very family friendly. Most hotels have kid friendly swimming pools and Italians absolutely love children. All the walking you will have to do in hilltop towns with steep pathways mean older kids or children that are small enough for you to pack around, are ideal.